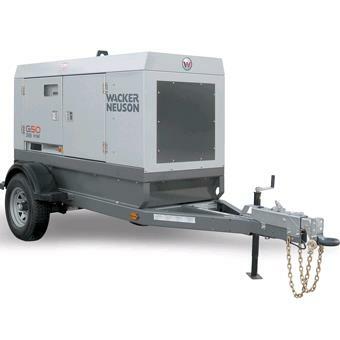 Heavy-duty mobile generator for reliable power. Unit offers low noise, mobile power for virtually any sound-sensitive application. Utilizing proven technology and simple design, this quiet generator provides excellent reliability in the most demanding environments. Durable features like stainless steel external hardware and automotive corrosion treatment of select body parts provide a long-lasting, quality appearance ensuring a high resale value. Generator control panel swings open as one complete unit for easy service-ability. Factory-installed customized options are available. These include, but are not limited to, a fluid containment system, an electronic governor and additional camlock panel. Trailers are fully equipped and highway ready with DOT lighting, chains, height adjustable coupler and electric or hydraulic surge brakes. * Please call us with any questions about our generator towable 70 kva rentals in Cleveland, Parma, North Ridgeville, Strongsville, and Cuyahoga County.